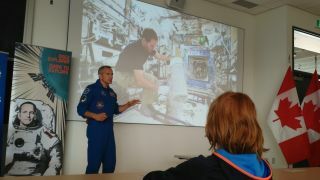 Canadian astronaut David Saint-Jacques gives a presentation about spaceflight to students in Ottawa on Oct. 24, 2018. The Canadian Space Agency said this would be his last visit in Canada before his spaceflight on Expedition 58. OTTAWA — Canadian astronaut David Saint-Jacques — who witnessed the aborted launch of Expedition 57 two weeks ago in Baikonur, Kazakhstan, and is next on the list to fly on a Soyuz — says he is more confident than ever in the Russian technology that carries astronauts to the International Space Station. Saint-Jacques was initially scheduled to fly into space Dec. 20 on Expedition 58; since the abort, his next flight date hasn't been set. Yesterday (Oct. 23) in Washington, NASA Administrator Jim Bridenstine told the National Space Council that he is confident the next Soyuz flight will still be in December, as the Russians are close to finding the cause of the abort that derailed the last crewed launch Oct. 11. "Of course, space is hard and things will fail. But it was very, very reassuring to see that with such a badly timed problem at a bad spot, even then, the crew were completely safe, the search and rescue operations were swift, and they were reunited with their families within hours. So kudos to our Russian colleagues for a safe operation." Saint-Jacques added there are teams around the world looking at different launch scenarios to keep the space station crewed. One possibility is that his flight might be launched earlier than originally scheduled, he said, but the crew will be ready. Saint-Jacques said he wrapped up his last training at NASA yesterday (Oct. 24) and is scheduled to fly to Russia later this week to complete final training and qualification exams. The Expedition 58 crew already anticipates changes to the flight manifest, since there are two fewer crew members on board than expected. Since maintenance on the station cannot be skipped, the first thing to suffer will be science experiments; Saint-Jacques said that hours spent on science will decrease. Also, NASA will likely not run any spacewalks unless there are unforeseen circumstances — or the agency has a high confidence that a spacewalk is not only necessary during Expedition 58 but will have a high probability of success. In Canada, this space station flight is quickly coming under national attention as the launch date approaches. In past months, larger and larger groups of reporters have shown up at routine astronaut presentations such as this one, to learn more about Saint-Jacques' work in space. The Canadian Space Agency said this will be Saint-Jacques' last visit to Canada before spaceflight. Flight opportunities are rare in this country because Canada's space station contribution (principally, in the form of robotics such as the Canadarm2 and Dextre) represents 2.3 percent of the international partnership. This means Canada gets only occasional flight slots; the last flight for a Canadian was in 2012-13, during which Chris Hadfield took command of Expedition 35. Canadian astronaut David Saint-Jacques (right) speaks with reporters in Ottawa on Oct. 24, 2018, along with Navdeep Bains, Canada's minister of innovation, science and economic development. Saint-Jacques again discussed the abort publicly in two separate presentations to elementary and high school students in Ottawa. "I know the rocket ride will be exciting," he said to the younger students. "I hope,not too exciting," he added, as the adults in the audience roared with laughter. Later on, with the high school students, Saint-Jacques briefly explained that an abort happened two weeks ago due to a problem with the rocket boosters. "But for me, they're not going to do that. They're going to bring us to orbit," he quipped amid giggles from the students. Besides talking about space exploration with the student groups, Saint-Jacques was in Ottawa to launch a new science experiment that he will perform on the space station, along with youth on the ground. The national science nonprofit Let's Talk Science created a programmable chip that allows students to measure the temperature, humidity and carbon dioxide concentration in their classrooms. Saint-Jacques will take his own measurements in orbit; all will be shared on a Let’s Talk Science-affiliated national database at http://explorecuriocity.org. This is one of several initiatives that Let's Talk Science will do in association with Saint-Jacques' flight. Last year, the organization launched Little Inventors, an initiative encouraging students to design fanciful experiments for space station use. While speaking with the high school students, Saint-Jacques explained his personal journey to space from elementary school student, to doctor, to his training as an astronaut. He advised the students to think of doing something bold with their lives, even if they don't end up where they expected. The observation was apt given the uncertainty surrounding his flight date. "If you have a dream, and set it in motion, something happens and your life unfolds," he said, adding, "just don't be obsessed with the end result."